What Does SJ’s City Hall Plaza Need to Become a Great Urban Space? 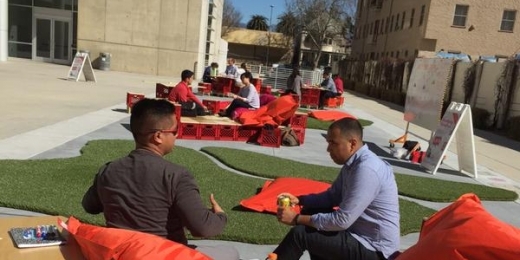 During a recent urban prototyping experiment, temporary furniture attracted visitors to San Jose's City Hall Plaza at lunch time. Photo courtesy the Tech Museum of Innovation. Furnished with café tables, auditorium-style seating, a water sculpture and a new Bay Area Bike Share station, San Jose’s City Hall Plaza has some of the makings of a successful urban place. Yet the reflective surfaces, lack of shade and few natural elements send would-be users to cozier spots, and 10 years after its completion the plaza lacks the sheer numbers of people that provide a daily heartbeat to other world-class civic spaces. While the plaza is a go-to site for some — including political protestors and the city’s fixed-gear freestyle cyclists — it’s not (yet) a truly civic gathering space for most of the community. For six days in February, Gehl Studio and the Tech Museum of Innovation tested a series of prototypes for animating City Hall Plaza. They turned bright red milk crates into stackable boxes that worked as seats, tables, performance stages and, as some imaginative coders used them, standing desks. They invited food trucks to come at lunchtime and plopped candy-colored beanbags on amoebic cut-outs of synthetic turf, then stood back and watched what happened, periodically moving the setup to different parts of the plaza. The prototypes were designed based on research conducted by the Tech and Gehl Studio with funding from the Knight Foundation. Surveys found that City Hall Plaza lacks a quality that Gehl’s designers call “stickiness.” People don’t “stick” to the plaza; they walk through it, or, more likely (surveys found), avoid it completely by walking around it. This isn’t surprising, however, considering that existing conditions offer little to encourage strolling or lingering. Across the street are an empty lot and a parking garage; a gas station, a couple restaurants and additional parking flank the plaza on either side. Quantitative data from Gehl’s survey of pedestrian and bicycle flows showed that the most-used path in the plaza is the one workers take from City Hall to the parking garage across Santa Clara Street. Gehl Studio presented the results of its research at a public forum in February, where participants mapped their favorite places in San Jose. Photo courtesy Gehl Studio. The prototypes tested how people would respond to different amenities and tried to understand the plaza’s constraints. The bright colors and food trucks successfully lured City Hall workers and passersby to sit, stay, eat lunch and even kick off their shoes. One of the most telling results of the prototyping, however, was the effect of microclimates on the plaza: A slight increase in temperature was enough to make loungers pull their beanbags into the shade — or head back inside. New furniture and ground cover, however, are hardly the end-all solution for activating the plaza. Gehl Studio’s Ghigo DiTommaso suggests that to truly animate the space would necessitate incorporating it into user’s daily lives. As part of the preliminary research, Gehl Studio found that for some San Joseans, their favorite places were simply the ones they habitually patronized, like their local corner store or coffee shop. To open a business in the plaza, however, would involve either an interested party with some serious organization and capital, or loosening some of the regulations that make permitting even small, informal events in City Hall plaza a time-consuming and expensive undertaking. For example, according to the city’s municipal code, a gathering with 30 people eating snacks and drinks requires the same permit application as, say, a 150-person fundraiser with on-site food prep and a band playing on an erected stage. Any event that, among other things, serves food or requires more than 20 chairs is classified as an “outdoor event” requiring a permit application submitted 30 days in advance and a $1,000 deposit, plus other fees. With regulations as strict as these for small gatherings, the prospect of starting a pop-up café or farmer’s market in the plaza seems unlikely without help from city staff. As SPUR explored in our Future of Downtown San Jose report, high permitting fees and rigid regulations limit creative uses of the public realm. It’s a Catch-22 that the city experienced first hand: the prototypes fell outside of San Jose’s prescribed uses for the plaza, so no one knew how to permit the project. This gave the city a close look into the challenges of its own regulations and permits. During the process of exploring permitting options for this project, the city made strides towards developing a new type of permit to allow more urban prototyping. This is a promising step in the right direction that we hope will continue. Building an iconic, future-oriented city hall in downtown San Jose in the early 2000s was a leap towards urbanity. But to truly reap the rewards of density will require extending more invitations to the public to enjoy the plaza — and supporting those who want to lend a hand in doing so. For the final step of the project, Gehl Studio and the Tech will release their recommendations for plaza activation this spring.